Dr. Karl Ulrich, collector of antique ice cream scoops and Wharton School’s Vice Dean of Innovation, had a problem with the frozen desert serving device. Most were awkward to hold and needed much twisting and wrist torquing to work. Karl shared these observations with his product development class and together they formed a hypothesis: A longer handle and angled head would work with your wrist’s natural rolling action. After proving their theory with a prototype, Karl teamed up with Co-Founders Jeff and Alan to create Belle-V. This scoop looks artful with its comfortable, elongated handle and angled head. The spade-shaped leading edge helps retrieve from hard-to-reach spots. And the solid aluminum construction is durable but also conducts heat from your hand—helping scoop even the most stubborn frozen ice cream. Belle-V was organically born from friends — a professor, an award-winning design firm and a successful entrepreneur — having fun working together. We share a love for products that are stunningly beautiful, perform brilliantly and exude heirloom quality craftsmanship. We believe that we have developed an ice cream scoop that has all of these characteristics. 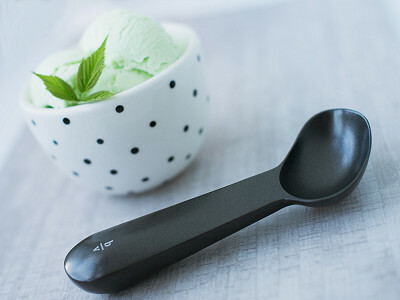 The result, in our humble opinion, is the best performing and most beautiful and durable ice cream scoop ever created. The Belle-V scoop is weighted and balanced to feel just right in your hand. The angled head with its spade-shaped leading edge maximizes leverage to comfortably drive through hard ice cream and get into hard-to-reach corners. The design conducts heat from your hand through the handle to more easily release ice cream. I look forward to sharing the story behind the Belle-V ice cream scoop and answering your questions. Hi All, I'm excited to be here and look forward to answering your questions! @Alan Nice idea and wonderful if it works, but way too expensive! @Cathy I have to agree. I was interested until I saw the price. i agree. can you make a less expensive version? You will sell a ton more! @kayla @nikki @kayla We love products that are stunningly beautiful, perform brilliantly and exude craftsmanship! We believe that we have developed an ice cream scoop that has all of these characteristics. Each scoops is born from a die-cast tool as solid and durable metal form. Then they are finished and polished by hand. Though no two are exactly alike, ?all Belle-V scoops are crafted to our exacting standards. @kayla agreed, I'm still laughing at the price. @James I agree. I am a gadget lover, but this is way too expensive for an ice cream scoop. I bought one at Penney's about 10 years ago for around $12. Similar concept, with angles to cut through hard ice cream. Still works beautifully! If it was made in America, I would be inclined to spend a little more, but $50, made in China, NO SALE. Do you plan to make a lefty version of the scoop? @Juanita We have tooled the left-handed version. Test units are in transit and we aim to have inventory ahead of the Christmas holiday. If you send your contact information to [email protected] we will notify you when the left-handed version is available. Appears to be ergonomic for right-handers only. Can you please confirm? @Robert See above -- today's sale is for the right-handed version; the left-handed version will be available later this year. Really $50? That's quite a price for an ice cream scoop. I think for $50, it should make and scoop the ice cream. @Chad @Connie Hand-finishing and polishing each scoop to our high quality standards is expensive. We seek to offer tremendous value, even at a premium price. @Alan I hope you didn't invest your retirement savings on this. Your price is higher than your standards. Half price, and I'd buy them as gifts for ice cream loving friends. We consumers have standards too, and we expect value for our money. I would love to have this but agree it is very expensive for the average person. I haven't found a scoop that is "perfect" yet.. and this one looks great. But it is too expensive. Is there a way to make this more affordable? Thanks @Karen. Our award-winning friends at LUNAR iterated several dozen designs to craft a scoop that is sculpted, weighted and balanced to feel just right in your hand. The angled head and spade-shaped leading edge contribute to exceptional ergonomic performance. @Alan Great product but the price point seems to be an issue. Let me ask another way...is it possible that, once established and in mass production, the price may be adjusted? I realize answering that question could hurt sales to the people reading this discussion but I believe the price point of $50 is doing that anyway. I have to wait as I'm a lefty! Thanks for your comment, @Max. Certainly! If we can find a more cost effective way to make this product to our high quality standards we will explore a lower price in the future. Exciting implement but as mentioned, costly. Will we get an answer about the cost? Costly, yes. How long do you anticipate this one will last? I've probably replaced my ice cream scoops every 1-2 years, most scoops seem to pit after a while. I've bought every brand out there. @Benjamin The Care Instructions are as follows: Do not place in dishwasher. After use, clean with warm soapy water, rinse and dry with a soft cloth - just like you would wash your heirloom silverware. Amy from The Grommet team here. We recommend that you wash this scoop by hand. Smiling as I read the "too expensive" comments on this ice cream scoop. Smiling because of the numerous ice cream scoops that I have purchased that "don't work" and hopefully laughing as I receive my new scoop that works wonderfully and lasts for a life time! @Marguerite @Penny If you are not over the moon with the performance, beauty and outstanding craftsmanship of this tool, I would be very surprised. And it comes packaged in a beautiful gift box that any ice cream lover would appreciated for a lifetime. Was it also designed for a left handed person to use with ease ?. Julia D.
Amy from The Grommet team here. Several people have asked and this scoop is for right handed folks, but a left handed version is in the works. @William at a lower price, I'd buy one for each family group for Christmas. Joanne, Chief Discoverer at The Grommet here. I'm aware that the price may seem excessive if you rarely eat ice cream but for people who use a tool more frequently and appreciate their ice cream, the value is there. We'll add the scoop for lefties as soon as it's available. We welcome every comment, thank you. Nah it's a ridiculous price. Feels like gouging rather than ice cream scooping. You'll wake up in the morning saying what was I thinking. @john I agree it is WAY too expensive and it better be put in a gold gift box. In the video it shows it scooping ice cream that is half melted which I could use a plastic spoon on! Frozen rock solid ice cream directly out of the freezer is the problem with scoops not working. Soft serve ice cream OR half softened ice cream is NOT a problem. This is my first comment on Grommet ever and yes I have ordered other items from here in the past. my hat's off to you alan! i am a ice cream scooper - gadget connoisseur too. love that you took the action on a vision and created a true innovation... actually improved something that many have tried and actually failed. and at the same time you spared no expenses and made it a piece of quality art too! your scoop is on my wish list and i will def buy it someday. good luck to you! Can't stop laughing at price,never sell many at that price for something from China!! !Time to get real. Very nice if you are right handed; but what about us LEFTIES??? 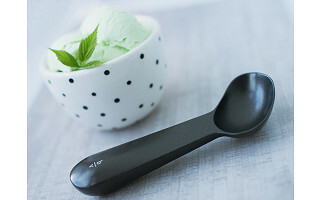 $50 for an ice cream scoop made in China? How much did it cost you; .2 cents a piece. And it's useless for lefties anyway. Besides, how many times a year does one scoop ice cream that it's so important to spend $50 on this ridiculous gadget. RIDICULOUS. CHINA, CHINA, no way. I will buy nothing from china or mexico. Sorry, but that price is a joke, right??? I have seen and bought other products on Grommet, some of which were as overpriced as this one. A $50 ice cream scoop? Seriously? Hey there, Grommet CEO here. One of the core tenets of our Grommet community is to be respectful of the Makers whose products we discover. It is not a goal to create a community where everyone agrees or every Grommet suits every person. Imagine how truly impossible that would be? We respect that the personal opinion of many here is that an ice cream scoop is just a utilitarian item and the $5 grocery store version suits them just fine. Some of our Makers would love to create a business with mass appeal like that. But others, like Alan, get into their craft or business because they simply want to make the best product they possibly can. These Makers work more narrowly-- for a customer who buys sparely with a focus on longevity, beauty or advanced ergonomics or utility and technology. It would feel very expensive and wasteful to that kind of person to buy anything that does not hold up and needs regular replacement, like the more mass market scoops often do. As an industrial designer I do appreciate this Maker's quest and the result. Not everyone does, or needs to. It would be boring if we all agreed! There would only need to be one ice cream scoop design in the whole world! Finally, it might be helpful to share that we review over 200 ideas a week to launch six. We stand behind the Belle-V as having stood up to that level of scrutiny for the beautiful enduring tool it is. For some, it will be best admired from afar, and for others it will be a great value. Let's understand and support those differences. @Jules I certainly understand what you are saying but you are hearing the personal opinions of "buying consumers" like myself. I am not a CEO of anything, just a hard working middle-income wife, mother and consumer. I love Grommet and love many of the products too but I stated my own opinion just like you did and like many others did and that is fair in my eyes even though some were quite harsh. Thank you for letting us speak. Who can afford a 50.00 ice cream scoop? This is for people who don't have to worry about money...I love ice cream but I would use a heated soup spoon before spending that..
@Sharon Agreed. I'm also looking at the picture, and comparing it to the hand, it looks as though it is a rather small scoop. I'm wondering what the diameter of the scoop itself is? I think I'll buy a nice $20 scoop, and spend the other $30 on a couple of really good quality ice creams. @Kate: The scoop is six inches tall. The head of the scoop is 2 inches long x 1.5 inches wide and forms pretty decently sized scoops of ice cream. My sister who is getting married in a few months would absolutely love this. Ice cream has always been a big dessert in our family. This scoop is elegant enough to serve as a perfect wedding gift. Thanks @alan ! @Saleena That is a brilliant idea. I just ordered one to give as a hostess gift. @Desmond @Saleena The scoop is a great gift for special occasions. Each scoop comes in a beautiful gift box made from craft paper, which is over wrapped with a designer sleeve and includes a branded storage pouch. not a bad price for a medical device but an ice cream scoop? 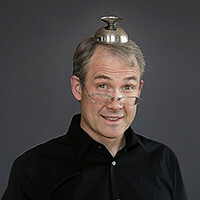 Dr. Karl Ulrich, collector of antique ice cream scoops and Wharton School’s Vice Dean of Innovation, had a problem with the frozen desert serving device. Most were awkward to hold and needed much twisting and wrist torquing to work. Karl shared these observations with his product development class and together they formed a hypothesis: A longer handle and angled head would work with your wrist’s natural rolling action. After proving their theory with a prototype, Karl teamed up with Co-Founders Jeff and Alan to create Belle-V.